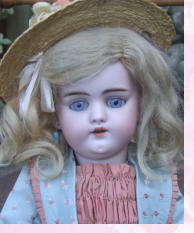 She has a perfect bisque head with open close eyes with full eyelids and pierced ears. She has her original mohair wig. There is a very small chip to the lower neck and a little bit of colour loss in that area but it is under the neck and can only be seen if you pull the head up to look. Her body isn't in bad condition but playworn and there is some patination mostly to the legs where the colour gets darker in places. One finger in each hand has been repaired and possibly the toes on one foot but none of these are obvious at first glance. She has her original stringing and l have not touched it as it seems firm and doesn't need it. She wears original clothing although the very full skirt does have some wear and a few tears, the silk hat has some holes in it too. The shoes or clogs really suit the outfit. l I am not giving this doll much credit it seems but sitting with her mandolin she looks very attractive, interesting and different. She measures just 16 inches and dates around 1910.